A cyclone which arrived during the National Championships, forced the abandonment of the Interstate Championships and some of the National Championships. A challenge was subsequently issued for the conduct of the men's eight, women's four and the sculling races but not all States could attend. An unofficial race men's eight race was then contested at Carrum in Victoria between the Victorian, Western Australian and South Australian crews for the Patten Cup. The event was sponsored by Cadbury. QLD - Bow: Robert McNeil, 2: Andrew Marshall, 3: Michael Davies, 4: Wayne Diplock, 5: Craig Hobart, 6: Paul Buckley, 7: Simon Smith, Str: Robert Jenkins, Cox & Cch: Chris Grummitt. Following the abandonment of the Interstate Championships, a challenge was issued for a race for the King's Cup but not all States could attend. 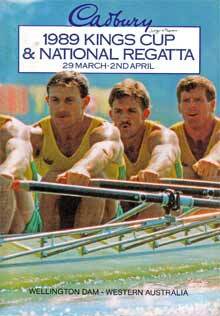 An unofficial race was then organised for Carrum Victoria on 23rd April 1989 and superb conditions prevailed. The crews raced for the Patten Cup, a magnificent pre-federation trophy donated by the Patten family. South Australia got away to the best start and led through the first 500 metres. The strong and lower rating Victorian crew stroked by Peter Antonie then broke through and then never lost the lead during the rest of the race. In fact they lifted their rate and powered away to win by 10.8 seconds from South Australia in second place and Western Australia a further 3 seconds back in third place. The time for that course in late April was quick, 5 minutes 47 seconds. In presenting the trophy, the marketing director from Cadbury Ian Johnson, noted the outstanding sportmanship of the rowers from South Australia and Western Australia in coming to Victoria for the race at short notice.